Wow! My does time fly! I can’t believe we are a week away from heading into the dust. 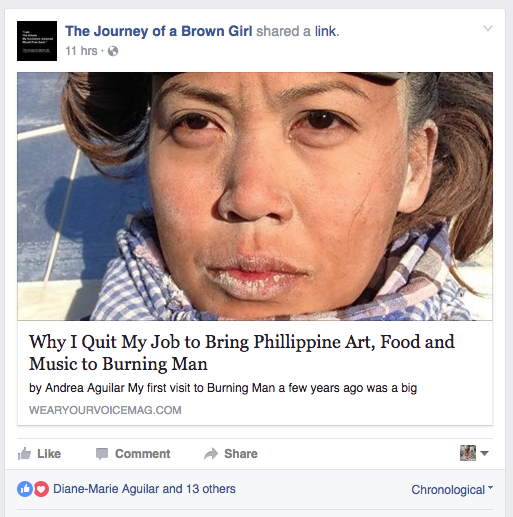 I had a proud moment last night as I as featured on “The Journey of a Brown Girl” Facebook Page! From the page: This is an extension of www.thejourneyofabrowngirl.com and seeks to be a space to share in the empowerment of Pinay sisters through story telling, reclaiming herstory and creating art and living for future Pinay leaders across the globe! The featured picture has great significance to me. It was taken last year after the most epic dust storm, which was on a Thursday. I just returned from the temple, a place I stayed far away from the whole week. For those who don’t know what the temple is, its a yearly structure that sits directly behind the “Man”. It’s a sacred space to honor yourself, your feelings, and those who have passed. It’s burned on Sunday, the last day of the event. Everyone gathers around and watches it set a flame in complete silence. Last year’s Burning Man was particularly hard for me. Two years prior I lost my father and Ryan (my husband) did as well. Right before we left for Burning Man, I also lost my cousin who I grew up with and Ryan lost his grandfather who raised him. I spent most of the event a little sad, with an uneasy feeling I couldn’t kick. In contemplation, I realized how unhappy I was because I certainly wasn’t living up to my full potential. Back to the temple… Ryan and I visited the temple that Thursday afternoon and as soon as we got there, we were trapped in a complete whiteout. 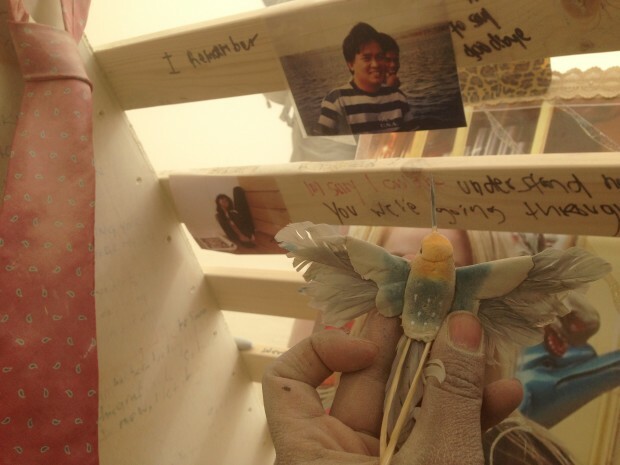 Finding a nook, we taped our pictures up and wrote messages to our loved ones. We huddled together, hugged, cried…I prayed to my mother who passed when I was two. I don’t remember anything about her, but I see her as the hummingbirds that like to cross my path whenever I’m having a hard time. I look down at my feet, and there it is. A hummingbird ornament. In in the harshest of conditions my mother was there to comfort me. This moment set me on the path of why I’m writing to you today. I’m here to contribute art and experience that I hope will inspire you to look inside of yourself and listen to that inner voice that sows the seeds of happiness. I have always been afraid and ashamed to say I’m an ARTIST. Burning Man has guided me to be proud of who I am and step into a position of being of service to others. Previous Post Previous post: Communal Effort: Crowdfunding Starts Today! Next Post Next post: We Did It!